Does everyone want to live in London? 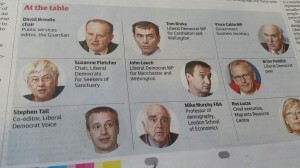 That was my deliberately provocative question asked at The Guardian / British Academy round-table on immigration I took part in last week at Lib Dem conference – reported in the paper here under the headline ‘A numbers game that does not add up’. One final – and telling – point came from Stephen Tall, co-editor of Liberal Democrat Voice. He asked all the members of the panel to consider whether they were indeed representative and whether they could actually understand the views of other people, from different backgrounds and parts of the country. Tall said that there was always a danger at a “Guardian roundtable” at a Liberal Democrat conference, of the contributors all coming from the same viewpoint and not understanding the mentality of those who came from elsewhere. “There is a tendency for us to assume that everyone would want to live in London and have a metropolitan lifestyle; I am not sure they do,” he said. I am, of course, as pro-immigration as they come: not just the economic benefits, but also the principle of open borders. But I’m a minority (a not very visible one). The more uncomfortable cultural question is one I’ve been thinking about more since moving house last year. I left very multi-ethnic East Oxford, where I’d lived (very happily) for a decade and re-located to the monocultural Horsham in West Sussex – and I love it there. Working in London as a commuter – leaving the house at 6.30am, returning at 7pm or later – I’m really enjoying the semi-rural tranquility. I get my dose of raucous urban life during the day: I’m more than happy to escape it at night and the weekends. London is a powerhouse, an immense force for economic good, where children from low-income backgrounds are more likely to succeed than anywhere else in the country, where people of every different race and religion rub along together well, a cultural mecca. But I don’t want to live there, thanks. And I’m not alone. None of which means I’ve changed my pro-immigration mind. But it suggests those of us who do believe in open borders need to do a bit more than simply point out the economic benefits of the UK being such an attractive migrant destination. 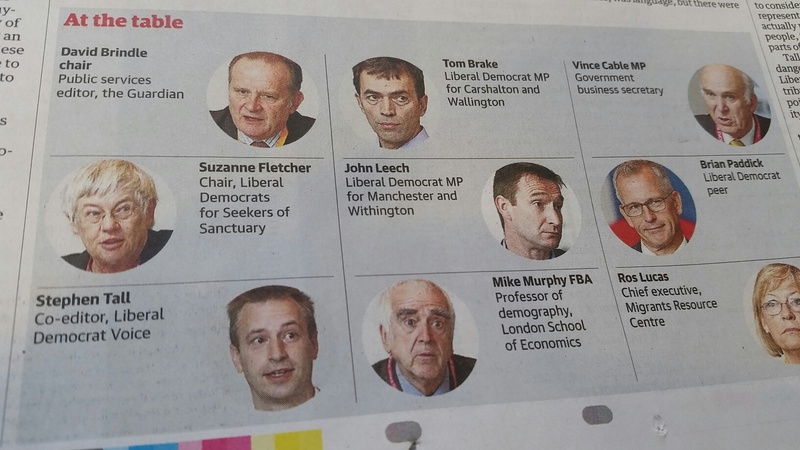 By the way, it’s well worth reading the contributions from the other participants at the table – including Vince Cable, Brian Paddick, Ros Lucas and Suzanne Fletcher – also available here.